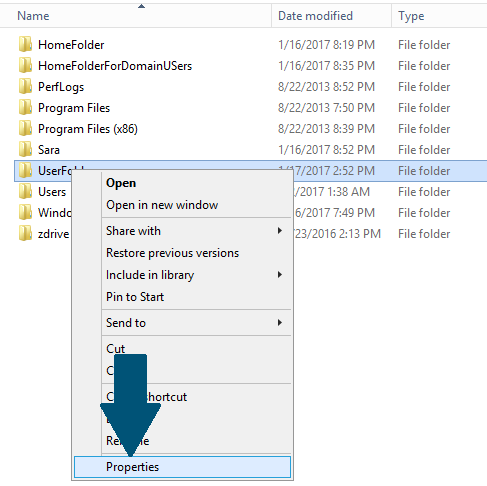 This article has been written to help you to setup correct permissions for the home folder in active directory domain services in Windows Server 2012 R2. 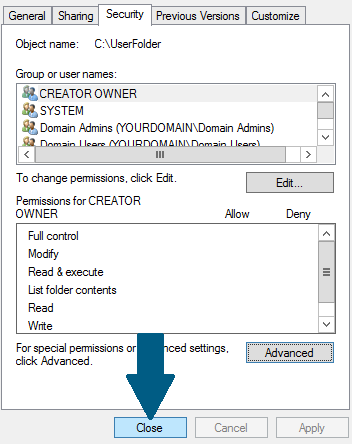 Domain Users - Traverse folder, List Folder, Create Folders in 'This Folder Only'. 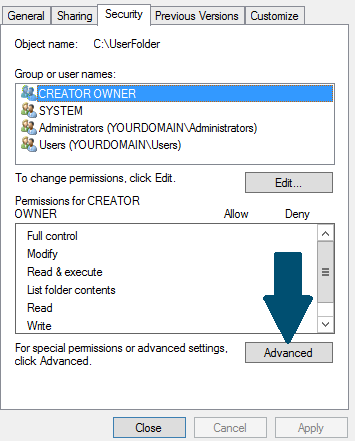 Creator Owner - Full Control in Subfolders and file only. System - Full Control in This folder, subfolders and files. 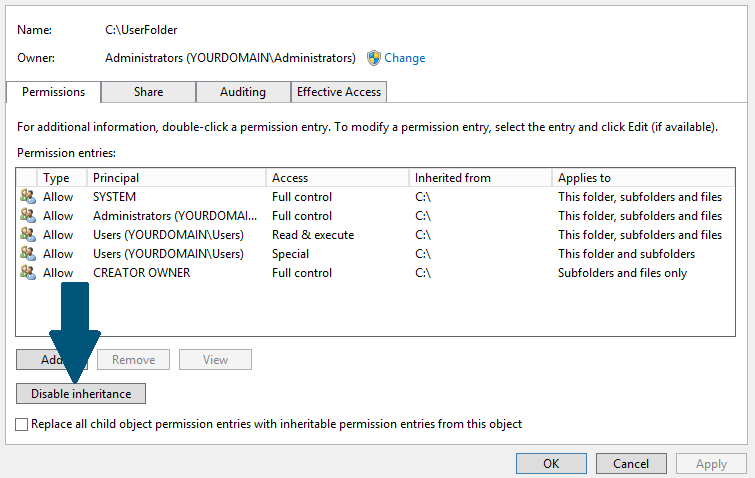 Domain Admins - Full Control in This folder, subfolders and files. 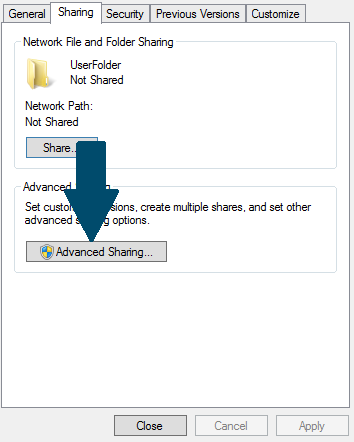 Step 2: Open Sharing tab and click Advanced Sharing. 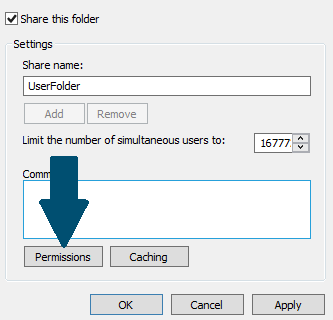 Step 3: Check Share this folder box and click Permissions. Step 4: Remove Everyone and click Add. 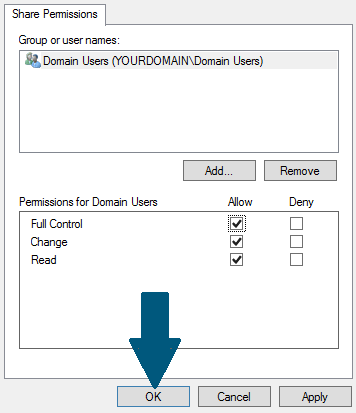 Step 5: Enter the object name Domain Users and click Check Names and then select Domain Users. Click OK. Step 6: Allow full control and click OK. Step 7: Click Apply and then click OK. Step 8: Open Security tab and click Advanced. 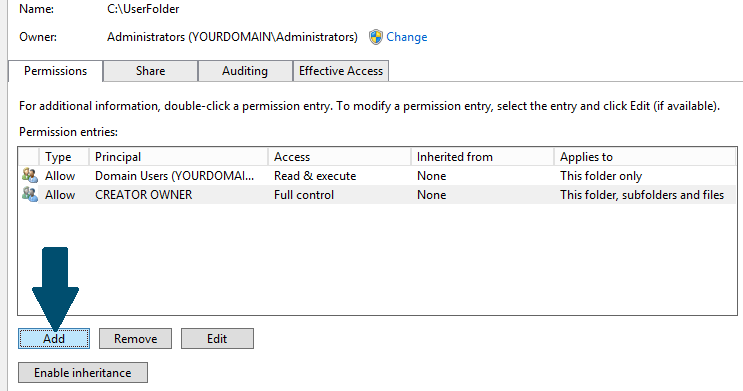 Step 9: Click Disable inheritance. 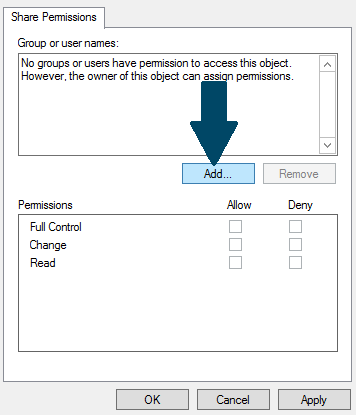 Step 10: Click Remove all inherited permissions from this object and then click Add. Step 11: Click Select a principal. 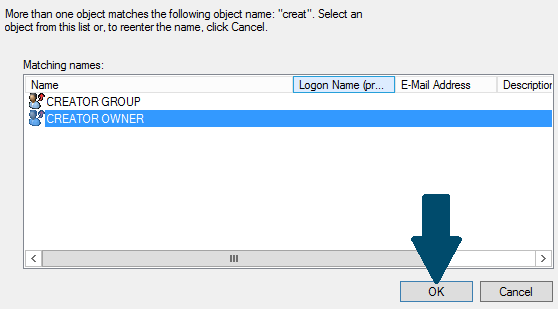 Step 12: Enter the object name Domain Users by using check names and select it. Click OK. Step 13: Choose This folder only from Applies to drop down. 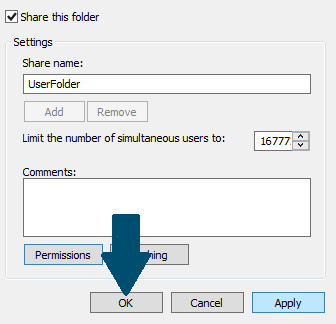 Keep default permissions and click OK. Step 15: Search creator owner and select it. Click OK. 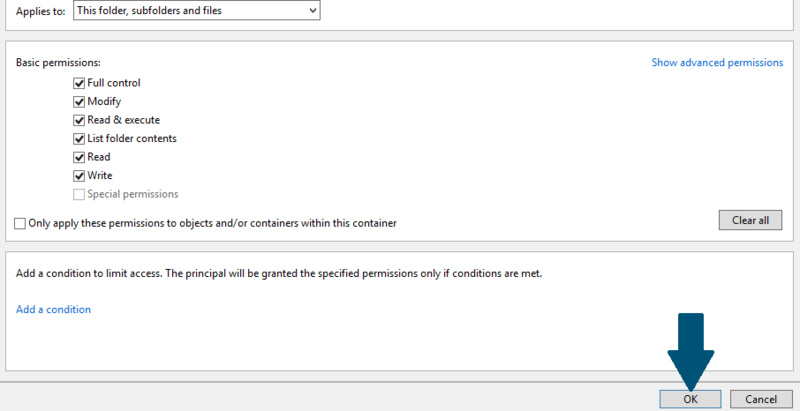 Step 16: Choose This folder, subfolders, and files from Applies to drop down. Allow full control and click OK. 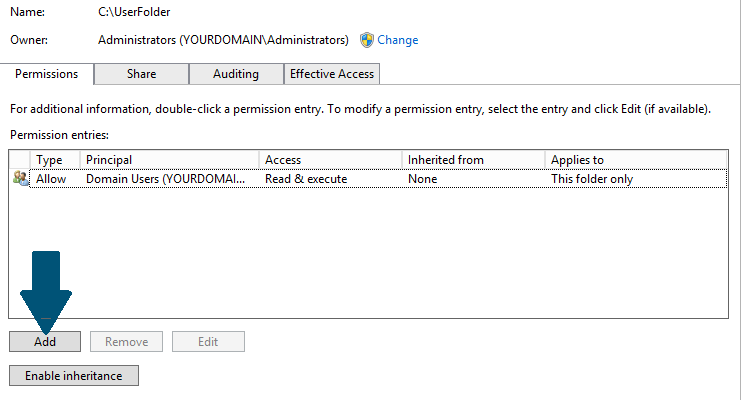 Step 17: Click Add and enter the object name Domain Admins. Click OK. Step 18: Choose This folder, subfolders, and files from Applies to drop down. Allow full control and click OK. 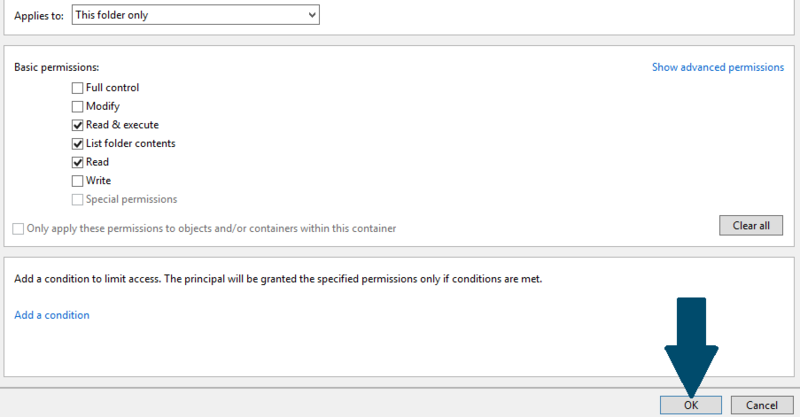 Step 19: Click Add and enter the object name system. Click OK. Step 20: Allow full control and click OK. Step 21: Click Apply and then click OK. Step 22: Click Close and you are done!! 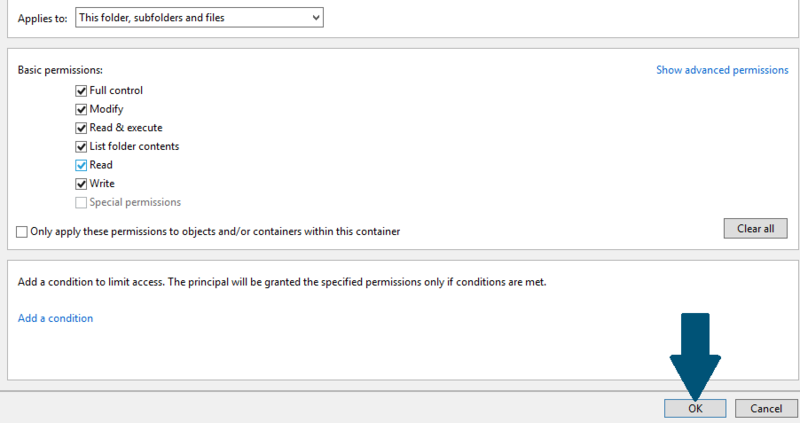 Without “Create folders/append data” permissions for the “Domain Users” it was not working for me. Otherwise it was not possible that the user folder will be created. Thank you. I used this instruction to setup cygwin open ssh home directory for sftp users. 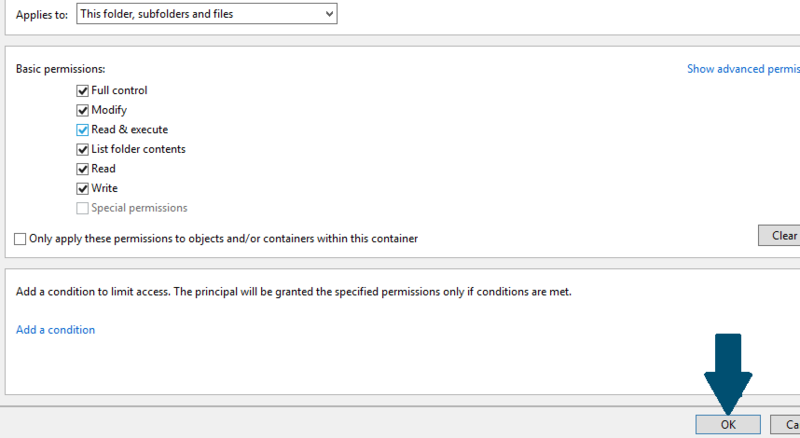 CREATOR OWNER should only have “subfolders and files only” .. instead of “This folder, subfolders and files” ?? I think your screenshot/steps are contradicting the initial information at the start of the document..